Has the right hon. Gentleman noted that Donald Trump’s mother was a migrant? She was not just from Scotland but from my constituency. Donald Trump’s first cousin’s wife was my English high school teacher, but we can leave that to one side. The right hon. Gentleman mentioned shame. As a Hebridean, I feel utter shame at how Donald Trump, the son of Hebridean woman, is behaving on the world stage. It is absolutely disgraceful and shameful. I hope he rescinds and changes the measure—not recasts, but rescinds it. Ian Paisley (North Antrim) (DUP) ... Could he also advise Northern Ireland citizens who hold Irish passports but who are entitled to full British passports on whether they should apply for British passports for ease of travel to the United States? It's not bad quality attempted trolling but it's nonsensical. It now turns out that Boris's "exclusive" deal exempting UK passport holders had already been obtained by Canada, and seems also imminent for Australia, New Zealand and perhaps given that trend,, Ireland. It's also not clear what the description of the deal given by the Foreign Office means, since, for example, no is flying directly from Mogadishu to the USA anyway. But finally, note Big Ian Jnr's inability to see beyond the opportunism of a preferential exemption to the principle that all nationals should expect the same treatment. That's the DUP in a nutshell. Sheikh Mohamed affirmed that extremism and terrorism have no religion or identity and the groups that preach false slogans and ideologies seek to disguise their criminal intention in spreading chaos and destruction. That's of course central to the debate about whether describing these groups as Islamic terrorism is useful. ... everyone's suffering in the Holocaust including obviously all of the Jewish people affected and the miserable genocide that occurred is something that we consider to be extraordinarily sad and something that can never be forgotten and something that if we could wipe it off of the history books we could. But we can't. And it's terrible. If that statement was made by Jean-Marie Le Pen, Marine Le Pen would be under pressure to disown it. It was made by White House Chief of Staff Reince Priebus on NBC's Meet the Press today. A U.S. service member died of injuries suffered during a weekend raid against al-Qaeda militants in Yemen, the military said on Sunday. Three other American troops were wounded in the operation on Saturday against members of al-Qaeda in the Arabian Peninsula (AQAP), the militant organization that has remained a potent threat amid an extended civil conflict in Yemen, U.S. Central Command (Centcom) said in a statement. This latest of many attacks highlights the shambles of US counter-terrorism policy in the Arab world. Donald Trump and those around him are obsessed with ISIS, to the point of announcing work on a new Plan to defeat them, with the indicated components of the plan consisting of things that the Obama Administration was already doing. But lost in the ISIS obsession is a group like AQAP, which in its strategy is a different kind of danger to Americans (for one, they've displayed continual ingenuity in developing ways to get bombs on planes). Another thing about AQAP is that it's the joint Saudi - Yemeni branch of Al Qaeda, and unlike ISIS, has remained loyal to the AQ leadership in Pakistan and Afghanistan. Of these aforementioned countries, only Yemen is included in Trump's visa ban. Finally, AQAP says that the raid killed a daughter of Anwar al-Awlaki -- he being American, she was also born a US citizen. The killing of Anwar al-Awlaki was arguably a major blunder by Barack Obama, given his role from beyond the grave in inspiring terrorist recruits. It's not much defence of Trump, but he inherited a lot of incoherence. Upon the resumption of USRAP [refugee] admissions, the Secretary of State, in consultation with the Secretary of Homeland Security, is further directed to make changes, to the extent permitted by law, to prioritize refugee claims made by individuals on the basis of religious-based persecution, provided that the religion of the individual is a minority religion in the individual’s country of nationality. Thus the wheeze to avoid mentioning religion directly is to say that if religious-based discrimination could be occurring, it has to be for a minority religion. The gamble is that therefore that the order would have its practical impact for Muslim-majority countries. As the order is tested, at least two problems will emerge. The first is defining religion, as opposed to sect, whereas for example Shia could claim discrimination in Sunni majority countries and vice versa. The second is Muslim minorities such as Rohingya in Burma/Myanmar and Kashmiris in India. Will they be beneficiaries of the priority under the new framework? Incidentally, countries that host USA pre-clearance facilities for US Customs and Immigration, such as Canada and Ireland, are now in a somewhat awkward position, as a policy with which they likely disagree is now being directly enforced on their soil. John Hurt. 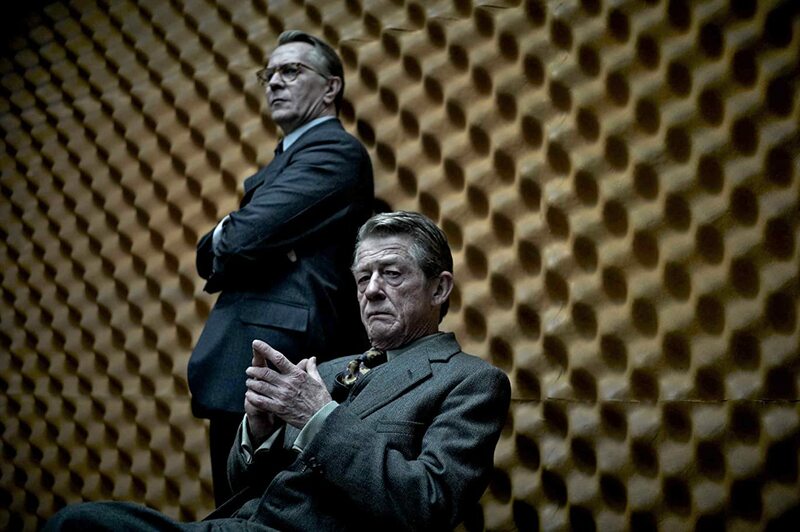 One could have picked 20 superb roles, but he was just fantastic as Control in Tinker Tailor Soldier Spy. Maybe, inspired by that, La Mer is the right elegy music for him. He started in Brussels convinced that Tony Blair would try to take the UK into the euro. “I was assuming things would come to a head much earlier than they actually did . . . I wish I’d done other things in retrospect.” His inclination now is to make up for lost time and he is considering leaving politics when his term expires in 2019. The high position of the single currency in Eurosceptic demonology is forgotten now, but it's the common thread from Thatcherism through to John Major's exchange rate crisis, and the Tories in prolonged opposition during the Blair era. Elsewhere in the aforementioned FT article, it's mentioned that Hannan's student writing at Oxford was fulminating about the Exchange Rate Mechanism (also forgotten: the ERM was a two-time winner of Private Eye's Bore of the Year award). Yet the single currency issue was killed without a fight by ... Gordon Brown. Could it be that the entire Brexit situation, which only became an electoral force after the single currency was off the table, happened because that there was a generation who had styled their careers as being against the Euro and now needed something else to validate that? 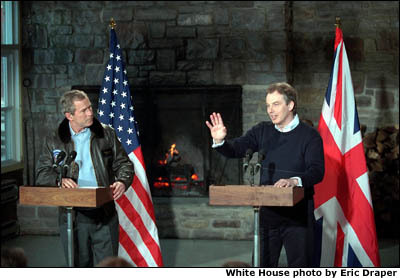 Bush and Blair at Camp David. The Security Spokesman of Ministry of Interior has stated that in implementation of the directives of Crown Prince Mohammed bin Naif bin Abdulaziz Al Saud, Deputy Premier and Minister of Interior, Prince Mohammed bin Naif Counseling and Care Center has granted beneficiaries of its two branches in Riyadh and Jeddah a mid-school year vacation starting from Thursday 28/4/1438 AH to Saturday. You wouldn't know it from the description of a care center giving beneficiaries a one week school term break starting tomorrow that this center is actually ... the rehabilitation program of the government for at risk jihadis aka "terrorist rehab." The students must have had good report cards. Reuters -- A leading contender for the Mexican presidency urged his government to lodge a lawsuit against U.S. President Donald Trump at the United Nations for the wall he plans to build on the border with Mexico to keep out illegal immigrants. Speaking as Trump gave orders to start work on the wall along the 2,000-mile (3,200-km) border with Mexico, two-time presidential runner-up and leftist opposition leader Andres Manuel Lopez Obrador said the announcement was an insult to his country. "I respectfully suggest that the government of Mexico presents a lawsuit at the United Nations against the U.S. government for violation of human rights and racial discrimination," Lopez Obrador told a crowd of supporters north of Mexico City. Reuters -- Britain's plans for a "hard Brexit" could lead to customs controls along the Irish border, Sinn Fein's new leader in Northern Ireland said on Wednesday, putting the onus on the government in Dublin to limit the damage. Prime Minister Theresa May has said Britain will not remain a full member of the European Union's customs union, potentially meaning a tighter border between the British province of Northern Ireland and the Irish Republic. It will be Britain's only land frontier with the EU once it leaves the bloc. Asked if this would make customs controls likely along the border, Michelle O'Neill told Reuters: "Yes... That is going to be the implication if we don't have our interests looked after and the Irish government don't step up to the plate." But as much as Mr. Trump has adapted to modern media, he is still a 70-year-old man who came of age in the era of three TV networks, when there were no niche hits. How did he get his citizenship? When? Thiel became a citizen in June of 2011, the Department of Internal Affairs have said. The "how" is yet to be seen. Getting residence in New Zealand as a super-rich person is fairly easy - you really just need to invest more than NZ$1.5m in the country, a drop in the bucket for someone like Thiel. But citizenship requires a bit more. If you and your family aren't born in New Zealand, then you need to spend 240 days of every year for five years in New Zealand before being granted citizenship, or be granted special permission by the government. Authorities in the United Arab Emirates have opened an investigation into a visit by Kim Kardashian to a Dubai government children's charity this month and suggested it undermined local values, a state-owned newspaper reported. Kardashian concluded a brief stay in the Gulf Arab emirate last weekend, shopping at the sprawling Mall of the Emirates and attending a masterclass there on makeup. However, the Emarat al-Youm newspaper quoted Ministry of Community Development official Wafa bin Suleiman as saying her visit to children at the Rashid Centre for the Disabled was not authorized and "had no goal from which students could benefit". The ministry is investigating why the center hosted Kardashian without its authorization, bin Suleiman said, adding that the ministry would have rejected such a request because approval depends on "full commitment to the customs and traditions of the state". Pot in new Kettle "outrage"
I think that the problems between the Kingdom and Iran have started since the eruption of Iranian revolution (Khomeini's revolution) in 1979 when Iran adopted a sectarian policy and sought to stage sedition in the Muslim world, adopted a supportive policy for terrorism through establishing Hezbollah terrorist militias in Lebanon and stormed the embassies, assassinated diplomats and carried out terrorist operations not only in the region but also in Europe, South America and other regions. These are the reasons of the problems. Farm groups expressed dismay on Monday at President Donald Trump’s withdrawal from a Pacific trade agreement they were counting on to sell a glut of American agricultural products in new markets. “It is critical that the new administration begin work immediately to do all it can to develop new markets for U.S. agricultural goods,” said Zippy Duvall, president of the American Farm Bureau Federation. Farm groups estimated the 12-nation Trans-Pacific Partnership would have added $4.4 billion annually to the U.S. agricultural sector, offering some relief to farmers during a multiyear slump in crop prices and farm profits. U.S. net farm income last year dropped to the lowest level since 2009, according to the U.S. Department of Agriculture. Many farmers backed Mr. Trump’s presidential bid, responding to his vows to roll back environmental and land-management regulations that many see infringing on their business. While Mr. Trump consistently criticized TPP on the campaign trail, farmers and agricultural groups hoped that he would renegotiate some aspects of it, or craft new and better trade deals in office. Now one country that is looking to sign an expansive bilateral trade deal with the USA and which currently has an agricultural sector protected from American food exports is ... the UK! Could the Tories handle a new Corn Laws debate? Donald Trump made clear today that he has in mind not just a general border tax (which would really be a type of VAT) but a tax specific to products of companies that are determined to have outsourced jobs that previously were in the USA. US trade policy will therefore be used to punish specific companies (and their shareholders) for decisions that are not illegal, but declared worthy of sanction by the legislature. That sounds like it violates the Bill of Attainder clause of the Constitution. Every part of White House Press Secretary Sean Spicer's press briefing yesterday is crazy (beginning with his claim that 720,000 people attended the inauguration) but if your time is limited to less than the entire 6 minutes, start at the 4 minute mark for peak incompetence (botches the title of Mexico's President and the day of Theresa May's visit). One incidental detail that emerges from it is the sensitivity to the Churchill Bust meme, an affair that we've been monitoring for a long time. It's forgotten now, but it was Nile Gardiner who got that story in circulation, and it never went away. BANJUL - Gambia's leader Yahya Jammeh said on Saturday he was stepping down under pressure from West African armies which entered the country this week following his refusal to concede an election defeat to President Adama Barrow. Jammeh is yet to leave the presidential palace but his announcement on state television overnight appears to signal an end of a political impasse. 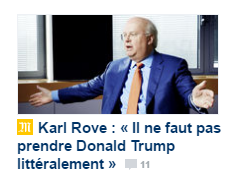 Another sign of the end times: Karl Rove explaining to French people via Le Monde that Donald Trump is not that crazy. 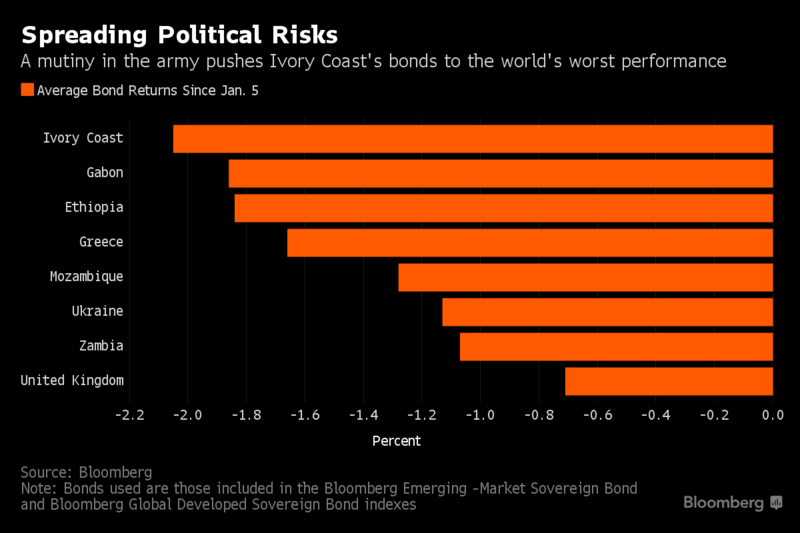 Via Bloomberg News, note the company that the UK is now in, based on sovereign bond returns over the last two weeks. British prime ministers are prone to spend their last days governing from a bunker. Convinced of their own immortality they dispense with forthright advisers in favour of devoted aides. The passage of time narrows their sight of the world beyond the front door of 10 Downing Street. Theresa May has started out where her predecessors ended up. The above is the FiveThirtyEight Premiership win probabilities. The probabilities are in the right column. The current positions and point totals are in the left column. One could wonder what is the value added of a model that's converting the observed form -- as reflected in the tables -- into a probabilities that reproduce the ordering of the table. That conceptual challenge of probabilistic forecasting, but more importantly, the deceptive ease of applying the methodology to political forecasts, is something that 538 impresario Nate Silver is not much interested in discussing. He is however working towards the conclusion that the need to rethink election analysis is deepest at the political desk of the New York Times. That's despite the fact that the justification of his poll-driven approach is heavily reliant on the notion that certain news stories get reflected in poll movements -- but he has no theory of which news stories make that breakthrough. In football, the events are clear: matches and scores. In political campaigns, the field, rules, and spectators are ill-defined, and there's only one actual electoral event. With the vast amounts of potentially relevant information and a single event, a slippage from data to punditry is inevitable. The healthy can see that paying the same price for insurance as the sick is a bad deal. Consider that logic applied to car insurance: the driver who hasn't just crashed can see that paying the same price for insurance as the driver who just crashed is a bad deal. Paul Ryan uses identical logic. Islamic State has ramped up sales of oil and gas to the regime of Syrian President Bashar al-Assad, U.S. and European officials said, providing vital fuel to the government in return for desperately needed cash. The regime’s purchases are helping sustain Islamic State amid unprecedented military pressure on the militant group in both Syria and Iraq. It is also helping the group despite the regime’s insistence that it is dedicated to eradicating the militant group with the help of its top allies Russia and Iran. Oil and gas sales to Mr. Assad’s regime are now Islamic State’s largest source of funds, replacing revenue the group once collected from tolls on the transit of goods and taxes on wages within its territory, the officials said. Their information comes from the monitoring of oil-truck traffic routes, which have changed from carrying oil to Turkey and Iraq to transporting it to Syria. Rebels also control much of the water supply to Damascus. In UK PM Theresa May's just concluded Bloomberg News television interview, she was pressed twice to give an example of "dysfunctional markets" (a phrase she has used) in which she would intervene. She didn't give any examples. This is despite the fact that she's mentioned housing, in the past, as such an example. Amid the Global Britain blather, it looks like the one sector that had the least connection to the EU is now off-limits with control taken back. 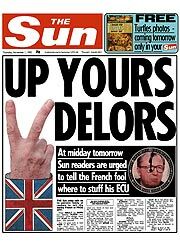 With The Sun reverting to its quarter-century old self, how long before this 1990 front page gets another go-round. Or alternatively, with German paper Die Welt having successfully trolled The Sun into today's response, maybe they should use the above as a model for another salvo? 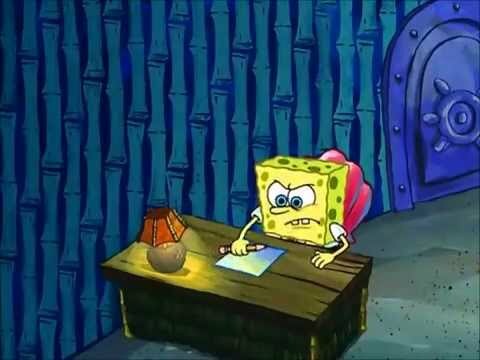 Spongebob writer's block and Donald Trump's speech preparations. And yet missing from these high-minded conversations have been meaningful challengers or critics of the underlying theme that was seemingly stipulated from the birth of this event 46 years ago: Globalization has the potential to benefit everyone ... Dissenting voices like those of Mr. Trump and Mr. Farage have rarely been part of the discussion — though perhaps that will change. Theresa May, Britain’s new prime minister, will attend this year, as will some of Mr. Trump’s advisers. If the World Economic Forum isn’t an opportunity to have an “international, global dialogue” about North Korea’s nuclear ambitions, especially with its foreign minister in attendance, then what’s the point? After all, the forum’s stated purpose is to “improve the state of the world.” ... For several years at Davos, WikiLeaks dominated talk among policy experts and business leaders. Was Julian Assange, the founder of WikiLeaks, ever asked to address the forum? No. Edward J. Snowden, the former National Security Agency contractor who leaked millions of documents about electronic surveillance by the United States government, has taken part in several events by video from Russia, where he is exiled. But he has never been invited, either ... Certain subjects have been avoided. Until last year, for example, discussions that focused on the rights of lesbian, gay, bisexual and transgender people were not on the agenda, in part, because certain delegations from the Middle East and Eastern Europe objected to the topic. 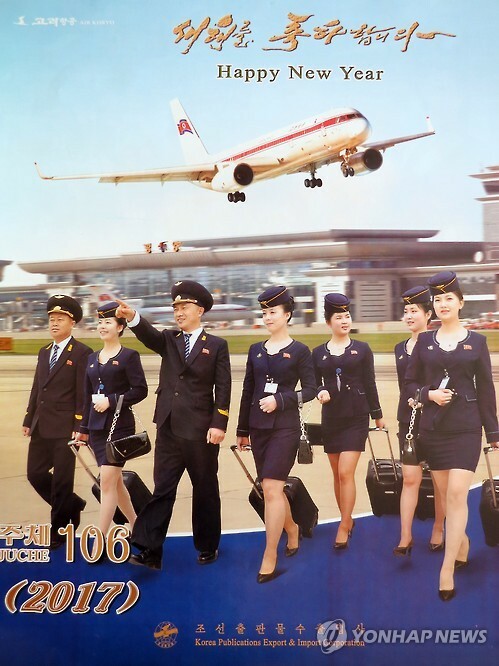 As for North Korea, the situation was perhaps untenable. The country’s participation at Davos would have made it difficult for someone like Mr. Biden and Prime Minister David Cameron of Britain to attend without being criticized. There's a subtle but revealing difference between the two diagnoses. Last year the complaint was that diplomacy was too dominant in determining who doesn't get invited, hence no North Korea or Julian Assange. This year it's that populists and globalization sceptics were absent for too long (but now Assange is not on the unvite list, despite being at the intersection of both trends). Let's suppose this year's wave of populists attend for a couple of years and even that something like the Trade Deal Job Loss Simulator is added to this year's gimmick, the Refugee Flight Simulator. Will the Davos sphere be any closer to an understanding of the broader cultural and social dynamics within the middle class (as opposed to between the "middle class" and the 1 percent) that has driven political developments over the last year? A deviously chosen gift from Bild editor Kai Diekmann to Donald Trump in the joint Bild/Times (Gove) interview that Trump gave to the two newspapers today. It's a souvenir of the Berlin Wall, signed by Michail Gorbachev, George HW Bush, and Helmut Kohl. Welt am Sonntag: Chancellor, will we be able to travel freely to post-Brexit Britain? Note the Brexit mindset: for British people, it's all about reassertion of Britishness, but for Germans, the usage is not "assuming you are a German citizen" but "assuming you hold a German passport." It's about having the right piece of paper. And they're the ones who mock citizens of nowhere! So we, obviously, want to have a system where they can get affordable coverage without going bankrupt because they get sick. But, we can do that without destroying the rest of the healthcare system for everybody else. Note the logic: people with pre-existing conditions are destroying the healthcare system "for everyone else" by needing to have their care financed from it! The risk with the decision of European met offices to get sucked into the ridiculous TV-oriented practice of naming winter storms: for the UK and Ireland, nothing has happened with named storms since Conor, but continental Europe, dealing with exactly the same north Atlantic low pressure system as the UK and Ireland did without naming it, is calling it Egon. The earlier attention on potential ambassadorial roles for Nigel Farage had focused on Donald Trump's scattered suggestion that he would be a good UK Ambassador the US. The strange amount of time that Farage apparently spent in communication with the US Ambassador to the EU, Anthony Gardner, raises the possibility that he wants that job -- which Trump could actually appoint him to (they'd find a way to sort out the citizenship issue). For all his mockery of ambassador functions (left), his name keeps coming up in that context. Photo: Reuters, from the Brexit celebration at the Ritz. To end a week which has seen indications of faded British spooks being manipulated by the Russians and the Americans. That's the US right wing and Russian noise machine alliance in a nutshell: National Review sourcing about the EU giving rights to robots to Russia Today. The only surprise is that the Tory press is not also cited. And as usual, it takes a bit more digging than the Outrage-Industrial Complex is willing to tolerate to find out what is going on. Yes, there is a European Parliament committee that looked at rights and liabilities related to robots. These issues become very real in an accident involving such machines and in this respect the Outrage over Robot Rights mirrors Boris Johnson's recent Outrage over liability insurance for lawnmowers. But all the committee did was ask the European Commission to consider drafting legislation in this area, and the committee's recommendation was accompanied by a sceptical legal analysis casting doubt on much of what the committee was asking for. Yet by the time the situation has been clarified, the talking point about EU rights for robots is already off on its own momentum. Will Trump bring it up at his next news conference? Image: the Krab Borg episode. The German economy expanded at the fastest pace in five years in 2016 and the growth momentum is expected to continue this year as rising private and state spending help Germany cement its position as the locomotive of the euro zone. Europe's largest economy expanded by 1.9 percent last year, a preliminary estimate from the Federal Statistics Office showed on Thursday, as an environment of low interest rates and a record influx of refugees fuel household and state spending. And so it came to pass that in the winter of 2016 the world hit a tipping point that was revealed by the most unlikely collection of actors: Vladimir Putin, Jeff Bezos, Donald Trump, Mark Zuckerberg and the Macy’s department store. Who’d have thunk it? And what was this tipping point? It was the moment when we realized that a critical mass of our lives and work had shifted away from the terrestrial world to a realm known as “cyberspace.” That is to say, a critical mass of our interactions had moved to a realm where we’re all connected but no one’s in charge. In the Cold War we reached for the “hotline," which was a symbol that we were all divided but at least two people were in charge—the United States and the Soviet Union—and in the globalization system we reach for the Internet, which is a symbol that we are all increasingly connected and nobody is quite in charge. That book was published in 1999. Amazon.com (AMZN.O) removed doormats resembling the Indian tri-colour flag from its Canadian website on Wednesday, after an Indian government threat to rescind visas of the U.S. company's employees if they did not stop selling the product. "Amazon must tender unconditional apology," external affairs minister Sushma Swaraj said on Twitter. "They must withdraw all products insulting our national flag immediately." "If this is not done forthwith, we will not grant Indian Visa to any Amazon official," she added. "We will also rescind the Visas issued earlier." Against this backdrop, as we’ve seen in the horrific tragedy in Syria, the Arab world will likely continue to struggle for stability—perhaps for a generation or more. And that's her verdict on the Arab world after 8 years of what she proclaimed as a successful foreign policy. Catastrophic Success! KAMPALA - Uganda's President Yoweri Museveni has appointed his son as his senior adviser, officials said on Tuesday, a move analysts said was part of a plan to groom him to take over the top job. The president's son, Major General Muhoozi Kainerugaba, was moved from his position at the head of the army's special forces, the military said, in what it called a normal change in command. In his speech to [Labour] conference, [PM] Callaghan said: “We used to think you could spend your way out of a recession and increase employment by cutting taxes and boosting government spending. I tell you in all candour, that option no longer exists.” Delegates sat stony-faced, Roberts tells us. Peter Jay, economics editor of The Times (and the PM’s son-in-law) acclaimed it as “the most breathtakingly frank public pronouncement since St Paul’s First Epistle to the Corinthians” — without informing readers that he had drafted the speech. That's the Malaysian Navy tweeting about a Chinese military submarine making a port call. The premise of the Obama Administration Pivot to Asia was that East Asian countries could be won over to a US-influenced bloc to counter China. The Wall Street Journal notes the significance of the Malaysia visit. And the President decided – I got a call Friday night, we met Saturday morning, and the President decided that he needed to go to Congress because of what had happened in Great Britain and because he needed the approval, and that was the way we do something like that. It wasn’t forthcoming very rapidly, number one. But number two, in the – the President never said, “I don’t want to bomb.” He never said, “I’m not going to.” He went to Congress to get permission to. And in the meantime, at a press conference in London – you may have been there – I was asked the question, “Is there anything that Assad could do in order to avoid being bombed?” And I said, “Yes. He could agree to get rid of his weapons.” And within an hour, an hour and a half, I got a phone call from Sergey Lavrov of Russia suggesting that was a really good idea, why don’t we work on whether or not we could do that? And President Obama and President Putin had actually talked about it a few weeks earlier in St. Petersburg, and I’d already talked to Lavrov – I’d actually talked to Prime Minister Netanyahu about it, who thought it was a good idea. And so all of a sudden, Lavrov and I were thrown together by our presidents in an effort to try to achieve that. And guess what? We did achieve it before Congress voted. The President never said, “I won’t drop a bomb.” What happened was people interpreted it. The perception was that he was trying to find a different road. And I will acknowledge to you, absolutely, I heard it all over the place. The perception hurt, yes. The perception hurt, but the perception came about despite the fact that we actually got a far better result of getting all of the weapons of mass destruction of Syria without dropping a bomb. And if we had dropped a bomb, there is no guarantee we would have gotten any of them out. QUESTION: Is Syria today a better result, sir? SECRETARY KERRY: No, obviously Syria is – it has nothing to do with that. What is happening today in Syria has nothing to do with the dropping or not dropping. It has everything to do with whether or not Assad was ready and willing to be held accountable by Russia and Iran to actually live by the agreements that they offered, and also whether or not the opposition was able to act in a way that could create enough leverage for Assad to have to come to the table and negotiate. And obviously, when Putin went in and put his troops on the ground to support – and his airplanes in the air to support Assad, that whole ballgame changed. We acknowledge that. He never connects that it's the same actor in the two stages of his argument i.e. that it was Russia which seized on his London remark about the possibility of removing the weapons to stave off an attack, and it was Russia that did not push Assad to follow up with deescalating the war. Bashar al-Assad learned one thing from the chemical weapons episode: that he could kill as many people as he wanted, as long it wasn't done too overtly using banned weapons. QUESTION: Perhaps, it would be worse if you were meeting with Hillary Clinton. Only a few days ago, she said that what Russia is doing in Eastern Europe resembles what Hitler was doing in the 1930s. PUTIN: It's better not to argue with women. But Ms. Clinton has never been too graceful in her statements. Still, we always met afterwards and had cordial conversations at various international events. I think even in this case we could reach an agreement. When people push boundaries too far, it's not because they are strong but because they are weak. But maybe weakness is not the worst quality for a woman. With the latest Russian announcement that they are reducing their military presence associated with Syria, the only thing we know for sure that the eastern Mediterranean will at least be less polluted by the black exhaust of the aircraft carrier Admiral Kuznetsov. Whether things get any better for the people in northern Syria is another question. Photo: Screengrab from Russian Defence Ministry propaganda video. Either way, he [the Bobo Dad] is as rooted and pinned down as any Shire Tory. However cosmopolitan their sensibilities, he and his wife are paragons of convention in the actual choices they make. They chose family, chose a home, chose dental insurance and most of the other items in the prose poem that Renton recites in Trainspotting. They are not cyborgs. Their educations did not — to their mild affront sometimes, I detect — conquer the human nesting instinct. And if these people are not citizens of nowhere, with their bohemian jobs and chic politics, their passports as thumbed as a theologian’s bible, then almost nobody is. There's not enough time to keep track of all occurrences, but since we've come across one particular case: this Breitbart News story about a mob of Arabs burning a church in Dortmund is simply false. That's not the actual headline on the story. The actual headline refers "migrant farm workers." There are a lot of assumptions packed into that word choice. The same people who extol Chinese gains thru globalization are worried to death Trump may adopt some of their trade & industrial policies. Finally, the leaders discussed  and expressed hope that upcoming diplomatic engagements will result in an agreement to reunify  as a bizonal, bicommunal federation. The trick here is what's inside the square brackets. In fact this is a phone call from President Obama Turkish President Erdogan, and the topic, inter alia, was Cyprus. Which brings up a question: why in one part of the eastern Mediterranean is the consensus that what is needed to resolve partition resulting from invasion and conflict is a bizonal bicommunal federation but just 260 miles southeast, it's a "two-state solution?" “Collective narcissists do not have a sense of humor when their group is concerned,” a psychologist says. We've played a trick on you. We've taken the headline from one Vox article about how "collective narcissism" (which seems to be another word for ressentiment) relates to Trump and Brexit but mingled it with the text of an adjacent but unrelated Vox article about metropolitan boutique gyms. The irony is that the case for narcissism is much clearer in the gyms article than it is the one about Trump. Now there is a deeper analysis to be written about how the class-based narcissism which the latter article well describes was in fact itself a contributor to the election of Trump, whose deplorables were most definitely not in boutique gyms. But that would open up the whole question of cultural class determinants of Trump and Brexit, a topic with which the New Pundits are not comfortable. 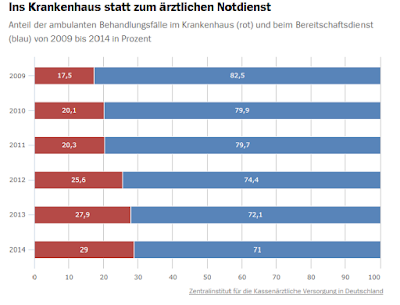 The chart is German data, percentages of outpatients seeking treatment in accident and emergency (red) compared to the on-call doctor (blue), 2009-2014. It's from an article in Der Spiegel which discusses the phenomenon of emergency room overcrowding in dispassionate terms, whereas in Ireland, emergency room overcrowding is Something Else Uniquely to Ireland That Must Be The Government's Fault. Two takeaways from the German case and the finding that overuse of A and E is a worsening issue. First, up to half the people in A and E as outpatients should not be there. For example, they've self-diagnosed (often through Google) that whatever ails them is the worst possible thing and head to the hospital. Second, the media-attracting phenomenon of long waits and stacked up patients is just the standard medical triage at work -- you assess and then prioritize treatment by the seriousness of conditions. With seasonal bugs, it's going to look worse, but if that's predictable for the hospitals, it's also predictable for the patients. Get a flu shot and don't socialize when you're coming down with something or you know that others are. Save the Tweets of Outrage for other issues (e.g. pylons or wind turbines). German Chancellor Angela Merkel is steering clear of the World Economic Forum in Davos, a meeting expected to be dominated by debate over the looming presidency of Donald Trump and rising public anger with elites and globalisation. Merkel has been a regular at the annual gathering of political leaders, CEOs and celebrities, travelling to the snowy resort in the Swiss Alps seven times since becoming chancellor in 2005. But her spokesman told Reuters she had decided not to attend for a second straight year. This year's conference runs from Jan. 17-20 under the banner "Responsive and Responsible Leadership". Trump's inauguration coincides with the last day of the conference. "It's true that a Davos trip was being considered, but we never confirmed it, so this is not a cancellation," the spokesman said. It is the first time Merkel has missed Davos two years in a row since taking office over 11 years ago and her absence may come as a disappointment to the organisers because her reputation as a steady, principled leader fits well with the theme of this year's conference. Her decision to back out last year should have been the first signal to everyone that attributes of the New Class had become a liability. But others chose not to see it. It's like Boris never stopped being the Brussels correspondent for the Telegraph. 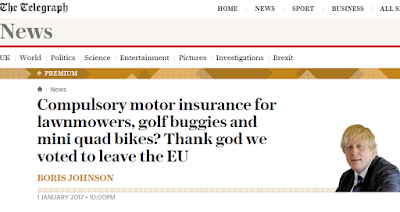 The underlying issue arises from the so-called Vnuk Judgement which does indeed some create some confusion about what type of vehicles and events need motor vehicle insurance. But (1) the confusion is being worked on (example), (2) the vehicles in question have real potential for accidents -- people forget that a quad bike is actually a little car without the pesky seatbelts or cab frame, (3) some of the hysteria revolves around a willful confusion of general liability insurance with the specifics of liability insurance on a vehicle used on a public road.